Honestly, I think we pretty much nailed it on the quantity of our hay supply over the winter. The new growing season is now upon us and farmers are talking about cutting their first crop of the year, as soon as next week if the weather is dry enough. We are down to our last rows of the bales harvested from our field last year. There are still a fair number remaining from the batch we purchased 2-years ago from a local farmer, but many are showing some mold and our horses have pretty much refused to eat them. Given all that, Cyndie still prefers to have a larger backup supply than we ended up with, so we have been in the market for a small batch of insurance hay. We did drive up to check on offerings available from our previous source, but the bales he had left from last year looked too similar to those we already have that our horses don’t eat. He suggested we consider some second-cut bales he will have later this summer. Second-cut hay doesn’t tend to have as many stemmy grasses, and probably has a few less weeds. For now, Cyndie kept looking, and on Thursday she drove to investigate some hay advertised in the free Shopper publication that is distributed locally. She said it looked good, and more importantly, it smelled good, so she brought home a small load of bales. Yesterday, since I was home from work, we went together to bring back a larger load. We had to wait until the rain stopped before venturing out, because wet hay becomes moldy hay. After lunch, she provided directions while I drove. 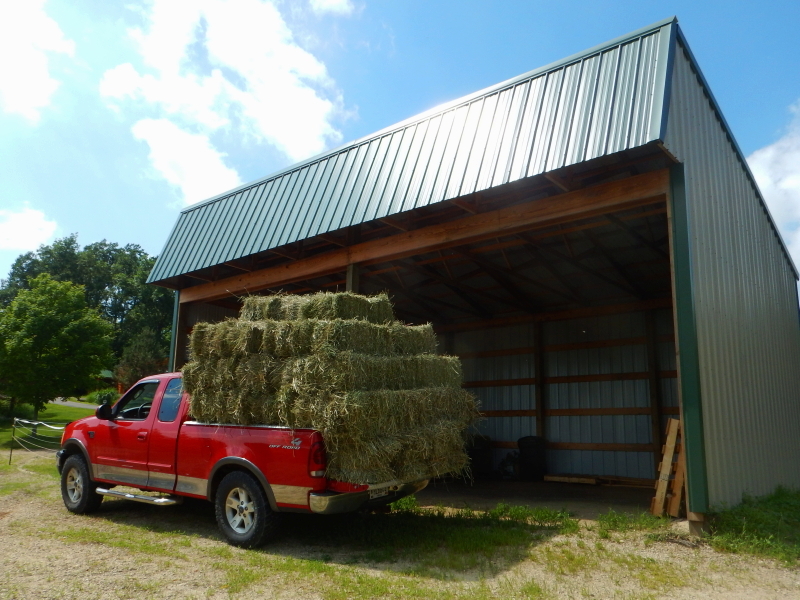 We were given free rein to pick our choice from the barn loft, so Cyndie tossed bales down and I organized them in the truck bed. Using the skills I honed in 13-loads two years ago, I stacked the hay so we wouldn’t need to tie it down. The bales above, hold the ones below in place. We made it home just as a new wave of precipitation threatened, forcing us to hastily unload the bales into the hay shed. The task served as a gentle reminder of the work that lies ahead of us soon. Hay season is not far off. It’s a time of anxious weather-watching and intense effort over several long days that are both thrilling and exhausting at the same time. At least now I feel comfortable knowing how many bales we want to put up to last a whole winter —plus some insurance— after several years of varying results. Simply having that one concern removed from the process makes it all a little less daunting.